After Breakfast drive towards Haridwar. Enjoy exploring local market and temples of Haridwar like Pareshwar Mahadev Temple, Daksha Mahadev Temple and Mansa Devi Temple. Evening visit Har-ki-Pauri (the footstep of God)- one of the most sacred ghats in India. People say that this ghat was built by Vikramaditya in memory of his brother Bhartrihari. This ghat is also known as Brahmakund. Later witness Aarti of the Holy River Ganges. Aarti is the beautiful ceremony in which deeyas (the oil lamps) are offered to God. Aarti can be done to a deity in the temple or it can be done to a saint. It is performed to God, in any manifestation, any form, by any name. The essence of the aarti ceremony is a time when we say "thank you," and we offer the light of our thanks, the light of our love and the light of our devotion. We realize that the small deeya is nothing compared to the divine light which shines on us all day. Night stay in Rishikesh. Later drive to Rishikesh - also known as the 'place of sages', at the confluence of the Chandrabhaga and Ganga. It is believed that God by the name of 'Hrishikesh' had appeared as an answer to the hard penances by Rabhiya Rishi and henceforth the place derived its name. It is the starting point for the Char dham pilgrims but also for the people who are interested in meditation, yoga and other aspects of Hinduism. 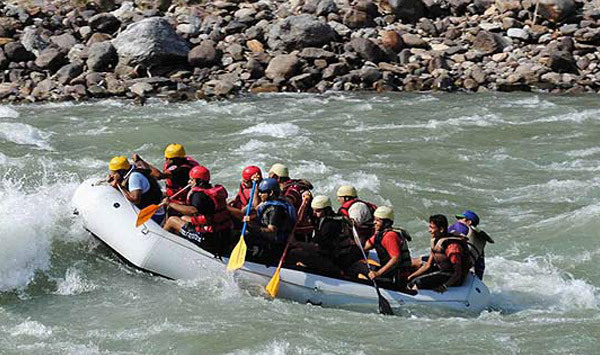 In Rishikesh visit Laxman Jhula- a hanging bridge on the river Ganga is one of the most famous spot in Rishikesh. According to Indian mythology, Lakshman, the younger brother of Lord Rama crossed the Ganga with the help of hanging bridge made of Jute. The bridge offers a scenic view of the river Ganga as it tumbles down to Haridwar. Also visit Bharat Mandir - the oldest temple in Rishikesh, near the Triveni Ghat. This temple is dedicated to Bharat, the younger brother of Lord Ram. Optional activities -White water rafting. Later afternoon drive to Delhi & transfer to airport to board the onward flight.